Melbourne street art is amongst the best in the world. 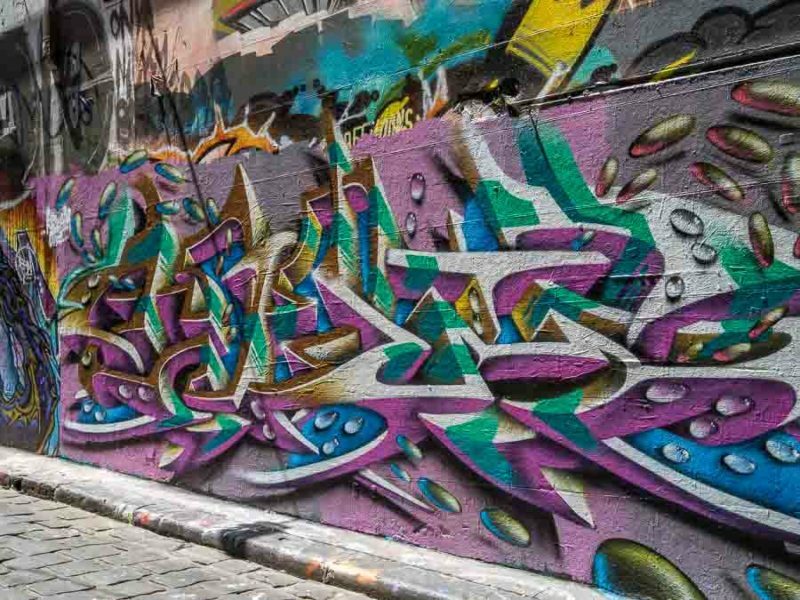 An ever-changing, dynamic and colourful collection of Melbourne graffiti laneways, the street graffiti found here is, in fact, works of art. The street artists are talented professionals, some already famous, others on their way. It’s one of my favourite cities for a getaway, so much so that this is our second visit in the last 15-months. Melbourne Australia is a diverse, modern, and fun city. We visit for relaxation, drinking coffee in laneway cafes, walking the neighbourhoods, shopping, and exploring the Melbourne street art. 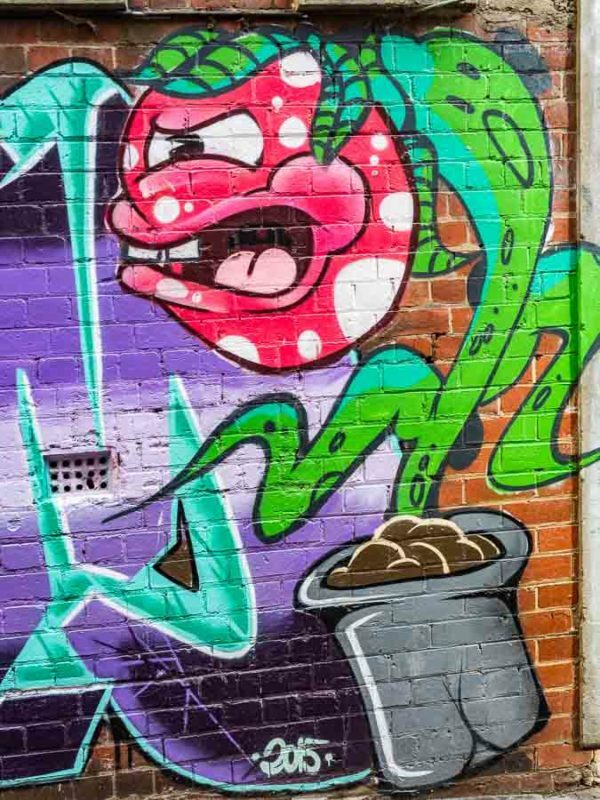 Australia’s second largest city is internationally known for its colourful and eclectic street art found on “approved outdoor locations” throughout the city. As street art is fluid, and the wall art is always updating, I have added the year I took each photo in the caption. 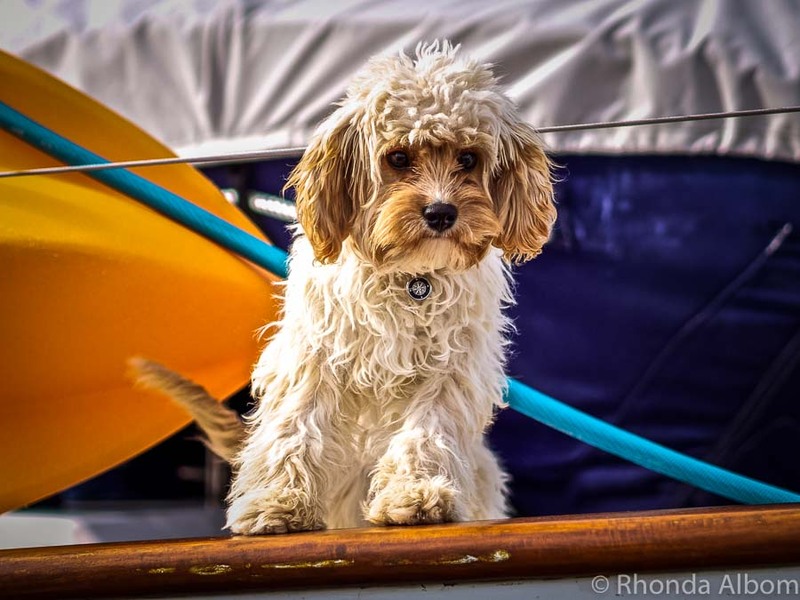 Watermarked or not, all photos on this page are ©Rhonda Albom. All rights reserved. 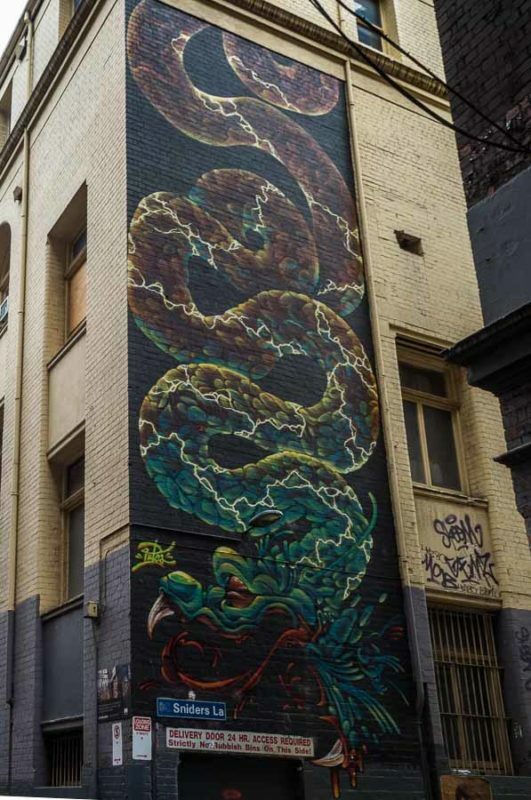 This nearly three-storey tall snake looks the same in 2018 as it did in 2016. It’s on Sniders Lane. 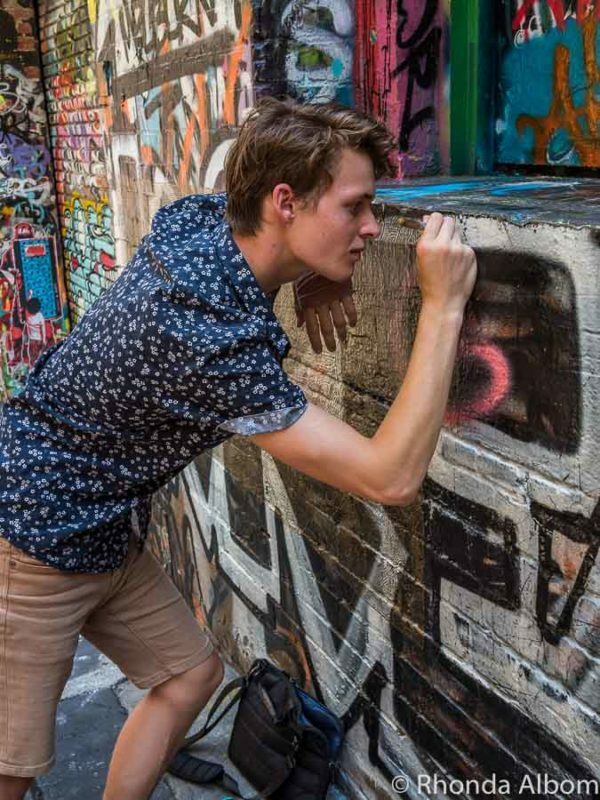 No question about it, if you only have the time or inclination to visit one of the Melbourne graffiti lanes, Hosier Lane is it. 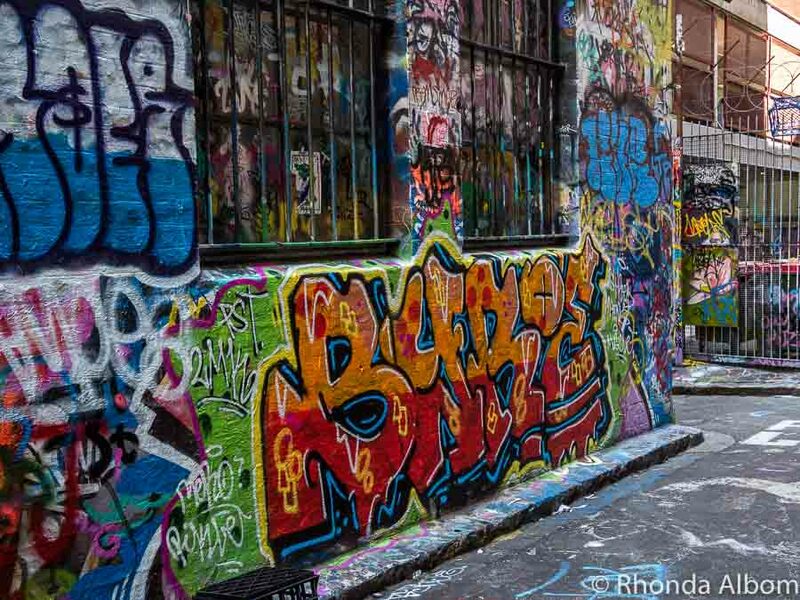 And as you walk about halfway down the street, you can’t miss Rutledge Lane, a Melbourne graffiti alley intersecting Hosier Lane. 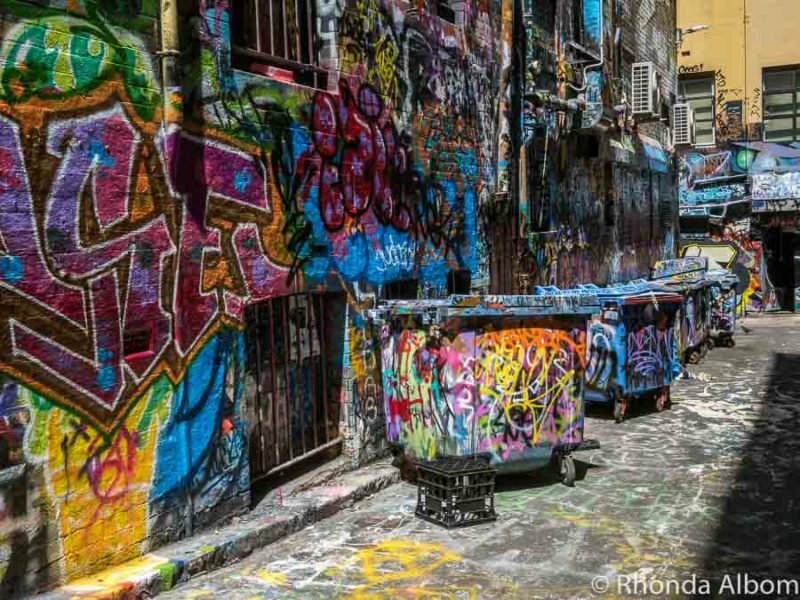 Ever changing, and overwhelming, Rutledge Lane was painted over in solid blue in 2013 by street artist Adrian Doyle. Funded by the council, it was an attempt to breathe new life into the graffiti-laden area. 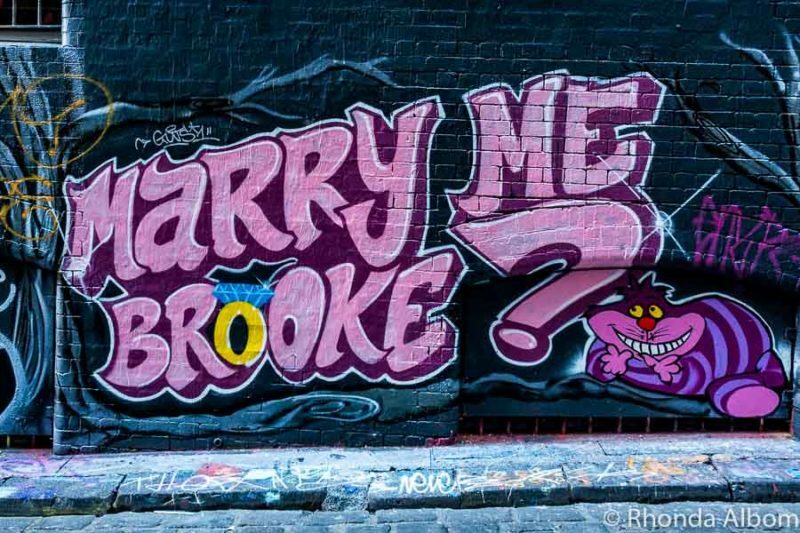 This romantic gesture on Hosier Lane in 2016 was completely covered over in 2018. Too bad, this one made me smile. If you know where to look, you can find the art of some of the world’s best street art artists like Rone, Phibs, Alexis Diaz, Ghost Patrol, Lush, Askew One, Sofles, and others. Possibly the most famous are the nine stencil street art creations by British street artist Bansky, who made during a secret trip to the city in 2003. Unfortunately, three were destroyed during construction in 2016 on AC/DC Lane, another two ruined in 2014 (also on AC/DC Lane), and two others in Fitzroy painted over in 2013. According to the Sydney Morning Herald, there is a push to preserve the remaining two. While we didn’t see any of the famous artists mentioned above, we did see a few people creating their own street art illusions. Street art is also a platform used for political commentary. Street Art on Duckboard Place around the corner from AC/DC Lane. 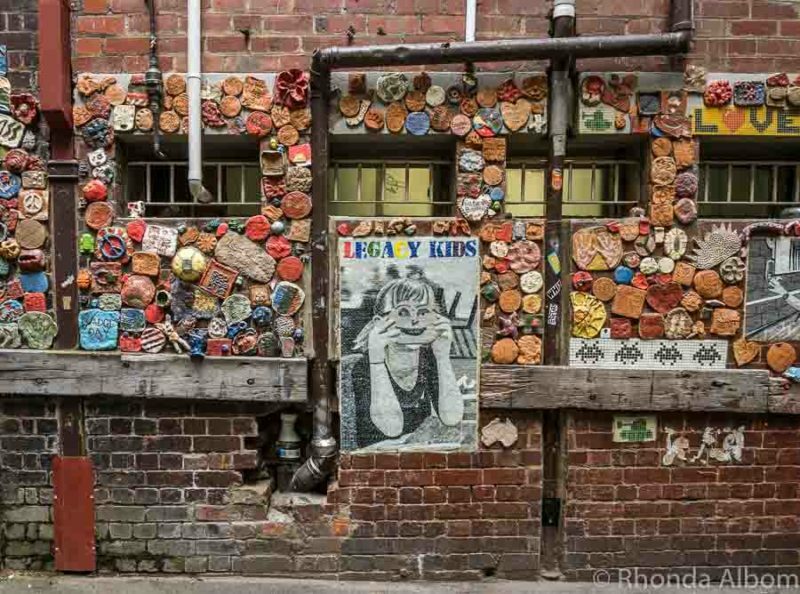 With over 1,000 ceramic tile pieces on display, Drewery Lane is a different example of Melbourne laneway art. Organized and taught by Sanker Nadeson, the ceramics are for Legacy House, an organization committed to caring for families of those who lost their life or health to defend the nation. Sniders Lane is a side alley off Drewery Lane, and a quick reminder to always turn your head and look down every laneway and alleyway, as you never know what you will find. 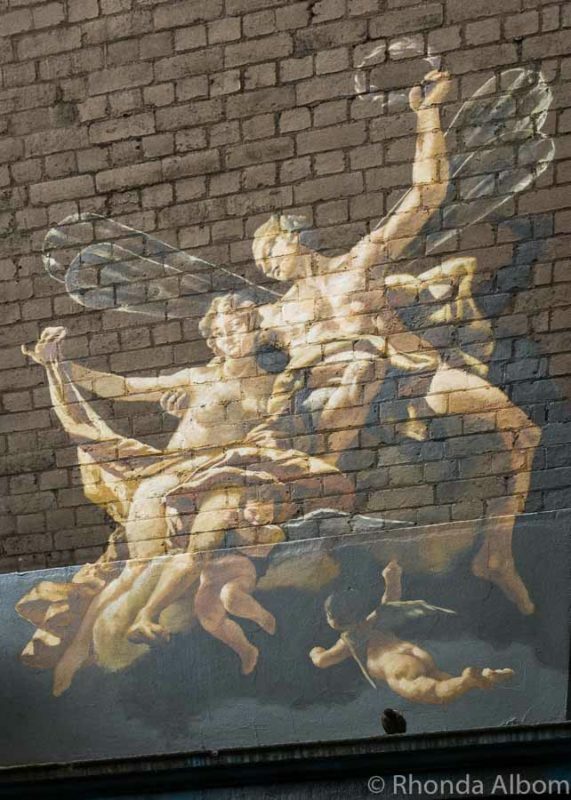 3D street art on Union Lane (2016). Labelled on the official map of Melbourne street art as Croft Alley, the sign at the street is Coverlid Place. What do you think, Melbourne Graffiti or Art? 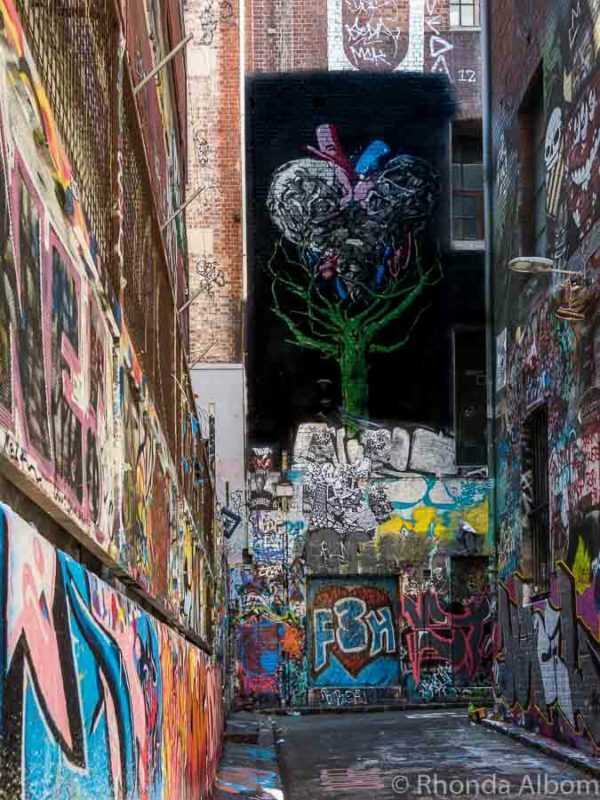 Lonely Planet included Melbourne street art on its list of the top cities to enjoy this modern artistic expression. 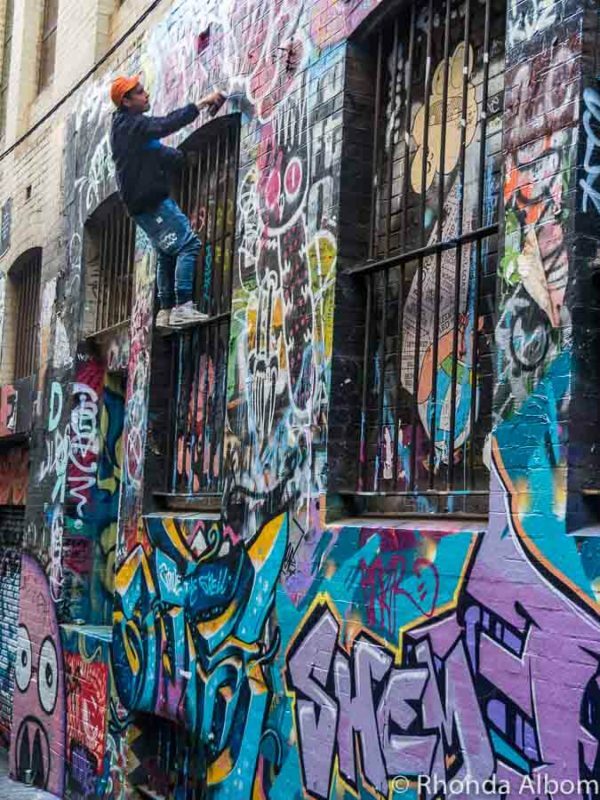 And, of course, Melbourne Australia is prominently featured amongst the 42 countries in Lonely Planet’s new guide to global Street Art book. 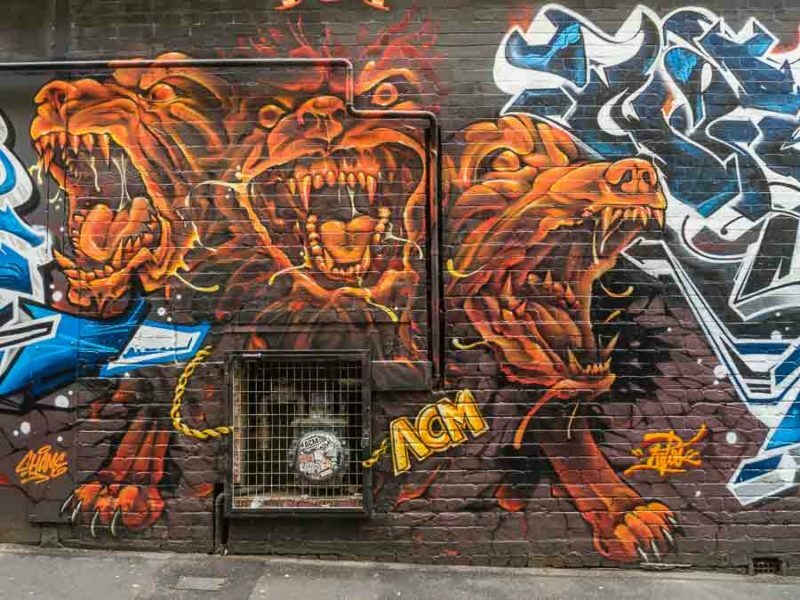 Hosier Lane and Rutledge Lane are considered to have the best street art in Melbourne, as well as the most comprehensive. Remember to turn and look up and down alleyways and laneways, otherwise, you might miss something special. Take the shot when you see it, Melbourne graffiti laneways are continually changing, and the same graffiti art may not be there the next day. 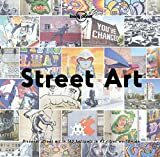 If you want to add your own cool street art, be sure to check out the current laws surrounding it first, as it is only legal in specific areas, with plenty of restrictions. Melbourne is not the only street art city. If you’re a fan, be sure to check out some of my favourite New Zealand street art in Auckland and Christchurch as well as this series from travel bloggers around the world including Australia and New Zealand, North America, Asia, Central and South America, and Europe. This is our third visit to Melbourne, and the first time we brought our teen/adult children. We drank coffee, ate some fabulous meals, visited a few landmarks like the State Library of Melbourne, St. Paul’s Cathedral, and Queen Victoria Market (more on these three coming soon). And of course, shopping, lots of shopping. There is nowhere better within four hours of our home in Auckland, New Zealand. What an artistic work of art, I hope I can see it personally, thank you for sharing. haha, streets look really interesting. I have never been to AU actually. I will surely enjoy the place if I do. Magnificent post.As i am a painter,so i love reading your blog.Pictures are the best part of this blog.These painting are totally amazing.I have never been to Melbourne,but after reading your post.I would definitely visit here in my coming vacations.Thanks for the post.Keep sharing. Wow! They have really gone for it on Rutledge Lane! It all looks wonderful! I did a graffiti tour with my son over here in Tel Aviv and we had a great time. 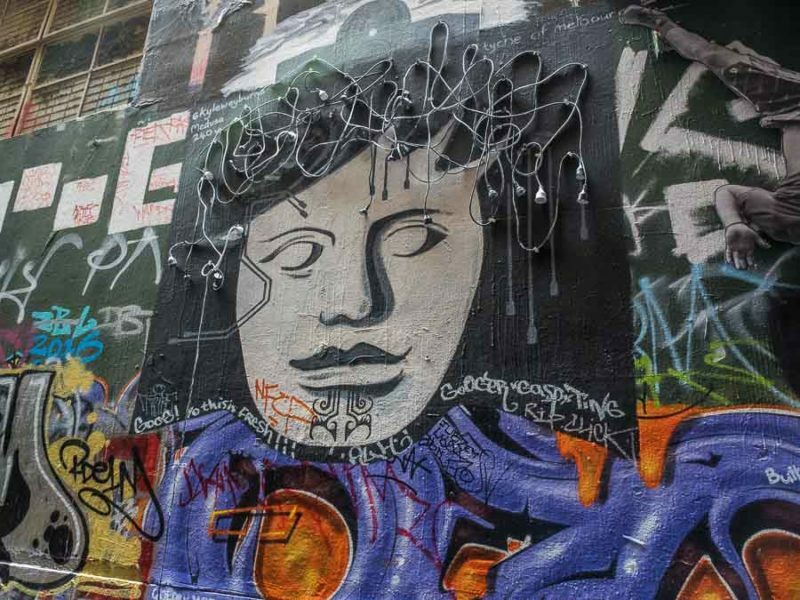 These are great pictures, and an interesting documentation of street art over time. I’m fascinated by the evolution of it! I’ve been to Melbourne a few times now and have stumbled across some street art here and there, but I think I need to make more of an effort to track some more down on my next visit. Thanks for the inspiration! Okay wow, this is some amazing street art! Love looking through all of this. Had no idea that Melbourne was known for street art. That one of Kim Kardashian’s selfie is amazing and also surprised about the Donald Trump piece (very interesting!).. thanks for sharing this, feel like I learned a lot about the street art culture there! Wow, what an incredible range of street art! I love spotting street art pieces in cities, it’s so interesting to see the political pieces and what matters the most to people. I’m a huge fan of street art and love going on art walks when traveling. 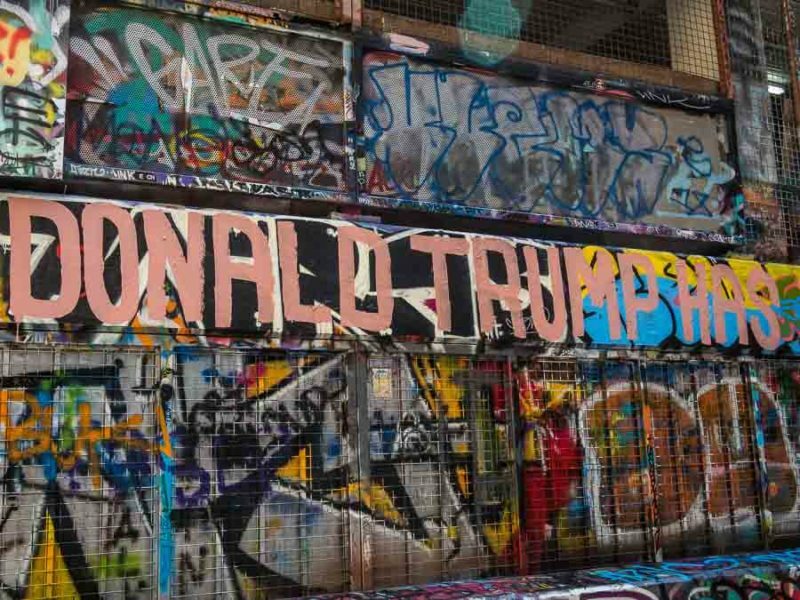 I also thought it was interesting to see your photo of a response through art to Trump in Melbourne. I guess living in the US, I tend to think that of him as OUR problem of a president but seeing him recognized through street art served as a reminder that the whole world is watching, feeling the effects as well and responding in their own way to the craziness of our current administration. 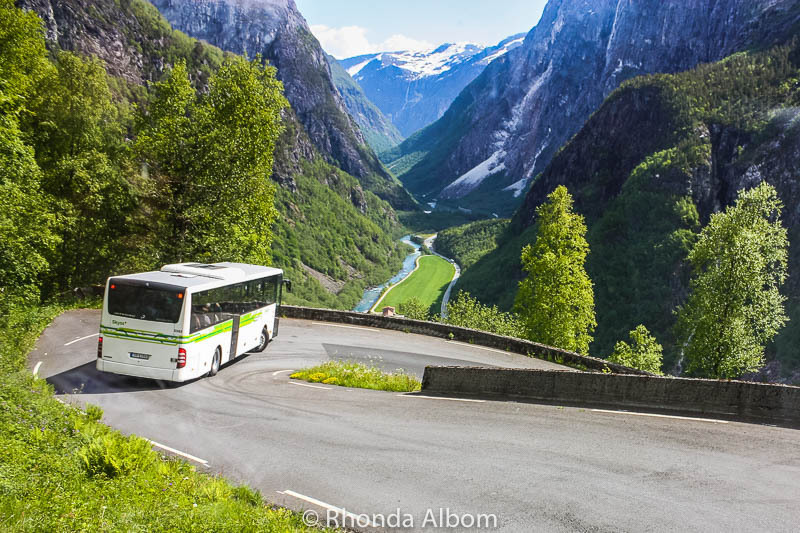 Thanks for sharing Rhonda! Hi! Longtime that I haven’t visited your blog! 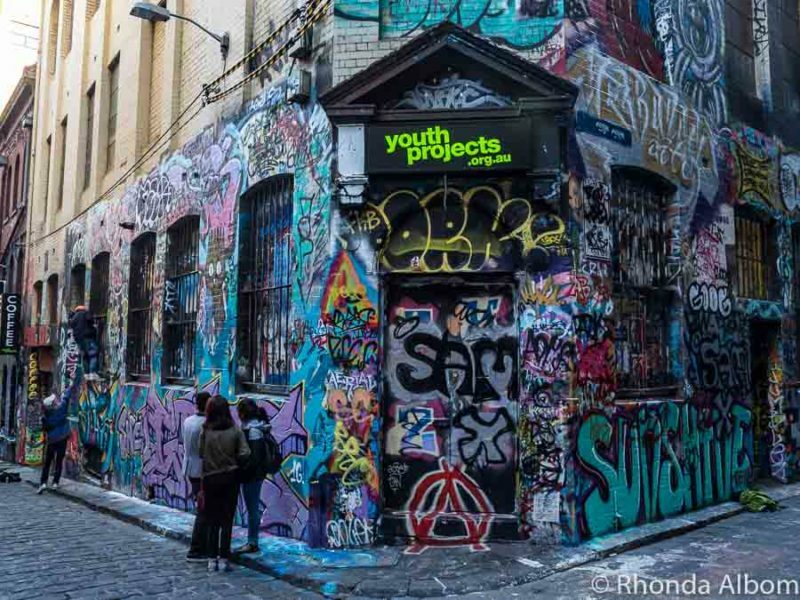 These photos are great, I am in love with Graffiti lanes and I go to see them to many cities where I travel, I really have something with street art, it is just fantastic! Well, if it has to be there at least most of it is actually art! Some of it is actually quite good! I remember in my youth living on the poorer side of town we had a lot of graffiti, but that wasn’t tasteful at all… mostly bad words etc. , but thanks for sharing the other side of town with us. The proposal was cute and the Prince tribute was a fine artist. I love the ones though with the cherubs and I think they’re fairies because they do have wings. It reminds me of that one great artist that I can’t remember his name at the moment. aughhhhhhhhhhhhhh Have a great day & thanks for sharing! I just love street art – each piece unique in itself and the artists are so clever. That is so very cool. Thanks for sharing. It’s nothing like that here. 🙁 I love the HUGE snake! Really all the color of all of them is so cool! We need more street art! I am a big fan and I seek them out when in a new city. Wow – these guys are for-real artists – the street art is astonishing! I was there when the proposal was painted – I have pics of it being done (but incomplete). Ha! Oh I missed these in my last visit. I would definitely go back just to see the street art… They look fabulous. Amazing shots and so much talent. Donald Trump has an ego the size of space and a brain the size of a walnut? Nice Prince tribute on top of the one at the Superbowl yesterday. The Duckboard place piece is mesmerizing. The 3 story snake is something else Rhonda. And some alliteration for you LOL. This is art. I had different views on graffiti before I hit the road. Now I see it is art, even if folks view it differently. The time and attention to detail floors you. How long does it take to finish some of these jobs? Inspired stuff! 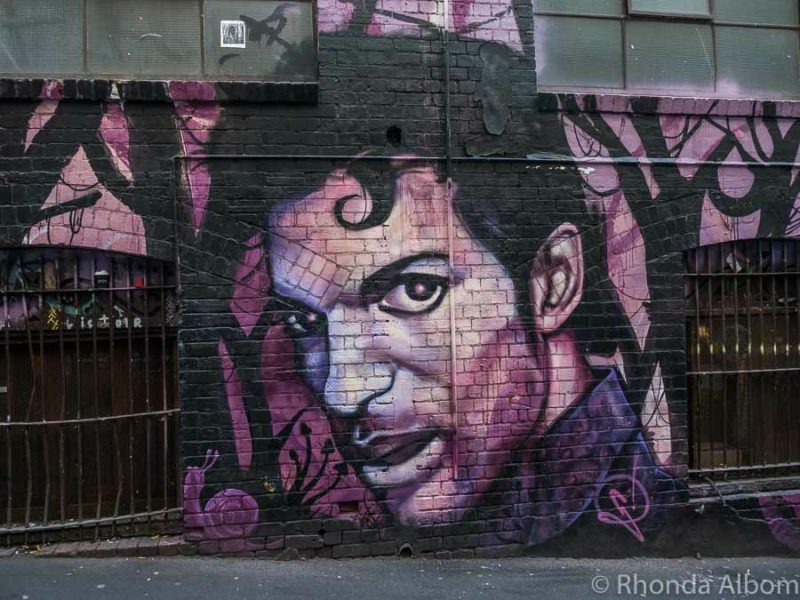 Indeed, this is amazing street art, Rhonda. I wish Melbourne was closer to Los Angeles (lol!) It’s so sad though that they cover up the old murals and replace them with new ones. While I understand there is a reason for that, I think it’s such a waste of talent and time. Think of all the effort is involved in creating these drawings just to see them disappear after a while. Holy crap! Some of these are absolutely amazing. I didn’t think much at first, and then I started to see the really big stuff. I love street art. I am not a great fan of graffiti though. I wasn’t impressed until I scrolled down past your first few photos. I’m saving this post for our next trip to Melbourne. I hope it wasn’t too hot/cold for you. Great city – awful climate. I love street art, it’s a great way to transform a dull and boring alleyway but I do enjoy more of the murals rather than tags. I love that it is constantly changing and much of what you have shown is totally different from when I was in Melbourne 2016. Wow! Fascinating that they encourage good street art, i am glad. That wedding proposal, i wonder if it got a yes. I definitely prefer the street art with actual skill and which does not look like just a bunch of graffiti. The Marry Me Brooke is super cute!! Thanks for sharing on #TheWeeklyPostcard! Very impressive. I like that they actually have maps of street art! Me too, it’s just so romantic. It’s definitely the most impressive street art I’ve ever seen – even if not in person, which I would love to do. 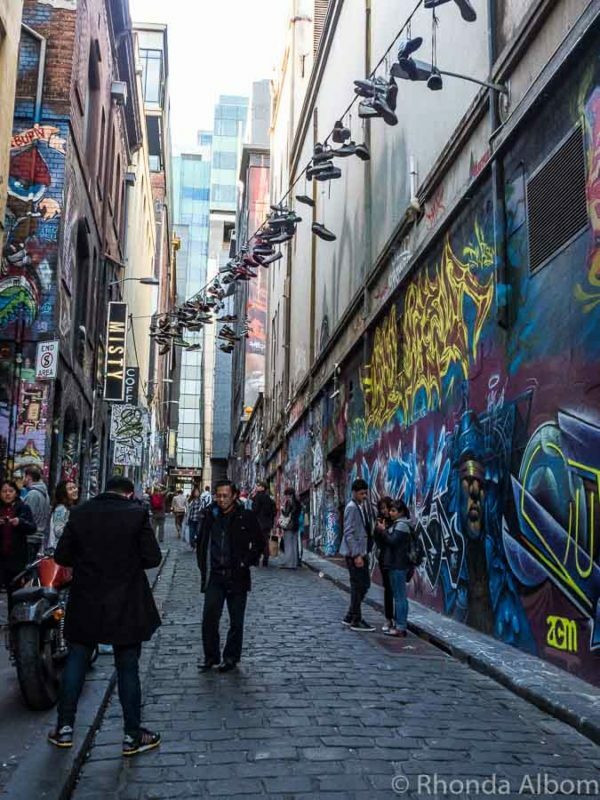 I’d always heard Melbourne was the king of street art – and your photos prove that to be true. Any idea how it became the most famous? I guess the right people discovered it. And now that it’s in the Lonely Planet book, it might do even better. Wow…the street art photos are stunning…I love all kinds of street art. Saw some great art in Clarion alley, San Francisco n in Prague but this is simply superb. I cant believe all the reference to american pop culture – 45, kardashians, prince! Also how in the world did the one that is like 5 stories high get created?!?!? Amazing! I cant even draw a stick figure so I am super impressed. Cool 🙂 When I visit Melborne will try to drop by here. You can get a map at the city information sites. HI Rhonda, amazing artwork! I would love to get the chance to browse somewhere like this and get to see some artwork in the making. The triffid-like flower made me smile too. We were pretty lucky to come upon three street artists during our walks. So, so cool! I could spend days there just wondering around. And, I think someone needs to find the happy couple and do a engagement shoot. How cool would that be?! My answer woudl be a definite yes. We didn’t hit all the streets on the map, and I am sure there are others in different neighbourhoods. Street art can be such a great way to give a facelift to an older section of a downtown area. We have a few samples here and I love them. These are a great selection ~ I love the bold, bright colorful ones. Thanks for the tour! I don’t think these are older sections of town. 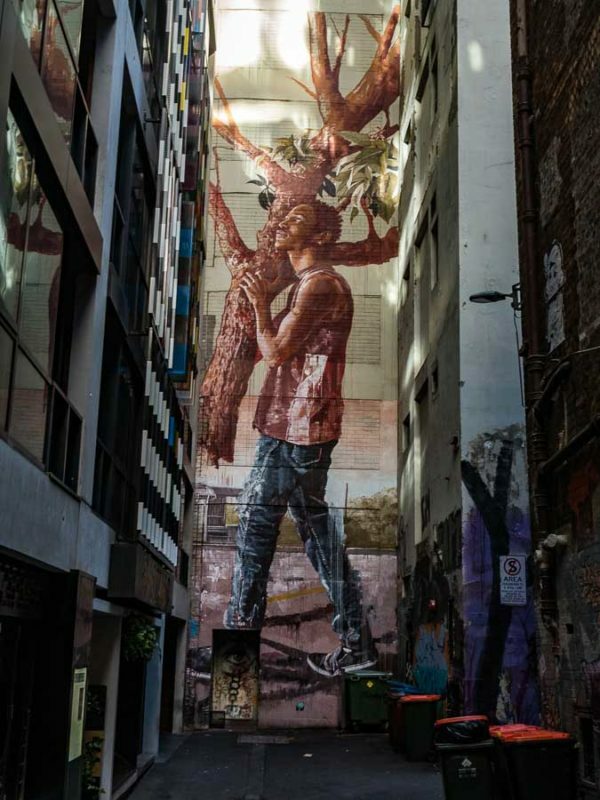 They are laneways, that are brought to life. Thanks for taking us on your trip to Melbourne. 🙂 You have captured a part of the culture that others would overlook. Thanks, Rose, it’s easy to overlook in Melbourne, as they control where it is allowed. We sought out the street art. Very creative murals. Very beautiful. I don’t like graffiti in general but the portraits and pictures are awesome. The one of the young black boy is very touching. Thanks for sharing! I didn’t used to like any of it. I am not sure when my attitude shifted, but I love it now. I was pretty impressed by the talent in the city. Those are so cool. Love all the talented artist. Very beautiful. It is a fun city to walk around. It was very impressive. And wandering with a map kept us focused, although still well over our 10K steps for the day. Some of those look a bit violent for my taste. It must be some feat to create some of the higher artistic contributions. I hope no one falls in the process. That might truly make it art to die for. There were a few other more nasty ones that I didn’t share here, but most of the street art was bright and colourful. Melbourne is one of my favorite cities in the world for street art. Thanks for sharing some great pics. It is amazing here, and the city even provides maps to help us find the artwork. An incredible array of street art. The snake and the aborigine boy are my favourites, but all are compelling. I contribute when it’s appropriate. I love the snake as well, but the fully painted street is my favorite. I have to get back to Christchurch one of these days. I haven’t been since before the quake. The art is beautiful. I especially love the colorful walls. I thought it was so cool to turn a corner and suddenly see every inch of walls and rubbish bins brightly painted. Wow! I always find street artists to be so incredibly talented, but so few appreciate their talent. Thanks so much for capturing these and sharing them with us. I love street art, and like you, am quite impressed by the talent. I agree with you, I loved that they painted the bins. I love all of them. The dragon, and Aboriginal child are my favorites. For both of those, I wondered how they were able to get up so high to paint it. I guess since it’s legal on those streets, they could use a man lift. That alleyway is just wicked. So many talented artists. There were a few like this. I just love them. I almost didn’t include the Prince tribute, so I am glad I did now. I have not been to Shoreditch. Where is it? Those are really creative. I love the dragon. I seem to be seeing a lot of dragons lately. I wonder what that means. I liked the marry me Brooke one the best. That made me smile. Me too. I just loved it. Congratulations Brooke. So glad that romantic gesture didn’t go to waste.